Walkthrough: After Gladion having made the connection that the Aether Foundation has been working with Team Skull to retrieve Cosmog, you, him and Hau will all go to Aether Paradise to find and save Lillie and Cosmog. You will arrive at Aether Paradise in the Docks, having to battling your way past numerous Employees to reach the elevator. Since the elevator cannot go down without Employee Access, you will have to head to the first floor. It is here that you will find and battle Faba, who will eventually send you on a wild goose chase in search of Lillie and Cosmog. Once Faba is defeated, Gladion will demand he give you access to the secret labs down below. After battling through more waves of Aether Foundation Members, the three of you will discover that Lillie and Cosmog aren't here, but rather on the floors above. You will then travel back up via the elevator, having to once again battle Faba and other Aether Employees. But it doesn't stop there! On your way to Lillie, who is actually beind held by Lusamine herself, you will have to battle Team Skull Members as well, including Guzma. The two groups have now formed an alliance! On top of having to dealing with Team Skull and the Aether Foundation, the Ultra Recon Squad will also show up and attempt to battle you to prevent you from reaching Lusamine. They have come to an agreement with Lusamine that sees them allowing her to use Cosmog to open an Ultra Wormhole so all of them can prevent Necrozma from breaking free and stealing the light from The Alola Region. Once all the Aether Foundation Employees, Team Skull Members and Ultra Recon Squad have been dealt with, you will finally find Lillie trying to convince Lusamine to let Cosmog go at the end of Aether Paradise. Lillie will warn Lusamine that her machine could kill Cosmog, but Lusamine believes the end result will justify the means she is taking. Gladion will try to reason with Lusamine - revealing that she is the mother to both Lillie and Gladion - hoping what happened to their father where Ultra Space is concerned would be enough to change her mind. But it isn't. She will then battle you. 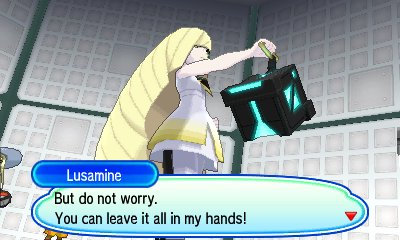 After you defeat Lusamine, she will continue with her plan and use Cosmog to open a Wormhole. By doing this, Cosmog will take on a new form that doesn't see it move at all. From there, Lusamine and Guzma will head into the wormhole WITHOUT the Ultra Recon Squad, double-crossing them in hopes of selfishly defeating Necrozma all by herself. The Ultra Recon Squad will be very upset by this; however, they will ultimately give you the suggestion of summoning the Legendary Pokemon in hopes of using it to travel through Ultra Space and find Lusamine, Guzma and Necrozma. After all of this occurs, Wicke, who is actually on your side, will suggest staying the night at Aether Foundation before proceeding with finding Lusamine and Guzma. The next morning, you will discover Lillie has decided to change her appearance, in what she calls her Z-Powered Form. From there, Gladion will entrust you with a Masterball and one of two flutes needed to summon the Legendary Pokemon. He will then give Lillie and you a ride to Poni Island, hoping the Kahuna of the Island can help you find the other flute, while Hau looks to grow stronger in hopes of one day being able to protect the ones he loves. Details: After finishing defeating the RR Episode, you can return to Aether Paradise once again to battle Faba with his best team yet.